As official timekeeper of the world's most famous regularity race for classic cars, Chopard has created the Mille Miglia Chronograph self-winding watch in stainless steel for him. Inspired by the beauty of classic cars, its elegant curves, silver dial inspired by vintage car bodies and chronometer-certified engine express a perfect pairing of automobile design and mechanical watchmaking. With an emblematic rubber strap evoking 1960s Dunlop tire treads, this bold timepiece adapts flawlessly to the wrist. 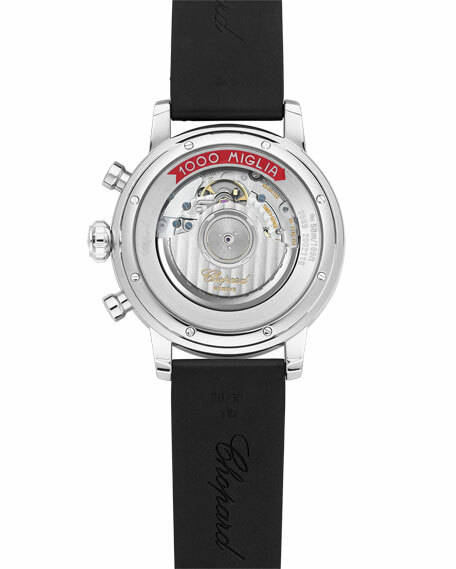 The Mille Miglia Classic models pick up the aesthetic codes of the oldest cars having having taken part in the Mille Miglia race between 1927 and 1940. Slightly smaller than the average sports watch size gives it a more conservative and retro look. 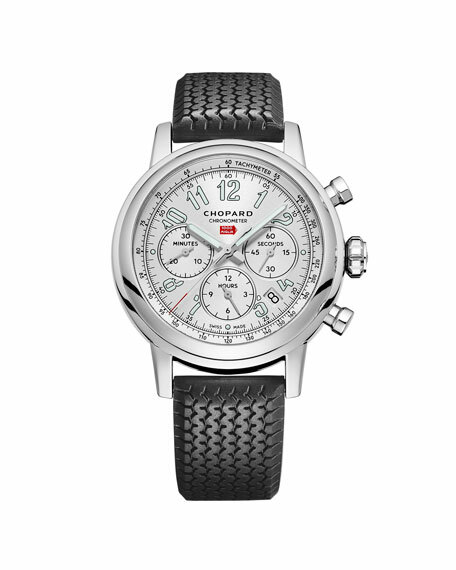 Chopard "Mille Miglia" classic chronograph watch. Silvertone dial with Tachymetric scale allows wearer to time vehicle speed. See-through sapphire crystal case back.